2/19 Tuesday, 80’s/60’s, mostly cloudy, E5 - While measuring Planet Express for a new spinnaker halyard yesterday, Dobbs discovered that the spinnaker messenger is fouled inside the mast, just like the auxiliary main halyard. The Taylors requested we sort it out, so, this morning at 9am, we went over and started. First off, the aux. main was crossed with the primary main and the jib halyard. We dropped all the sails so the halyards would be accessible. We pulled the aux. main out of the mast at the masthead. Dobbs had climbed up there on this halyard, so he had to secure himself by separate means. Then he dropped a messenger down to me, fishing a fresh run. The new run still had one cross with the main halyard, so we eased the starboard aft lower shroud so Dobbs could remove the shroud terminal and peer in and work through the shroud terminal socket. I fed the aux. main messenger back into the mast; he uncrossed it and lowered it back down to me. Two halyards cleared! We hoisted the mainsail and furled it away. The messenger for the spinnaker was fouled with the staysail halyard. We pulled the spinnaker halyard out of the mast and fished a clean run the same way as with the aux. main halyard. This cleared the remaining 3 halyards. We hoisted the headsail and staysail and furled them away. While the chair was up, Dobbs took care of a minor repair to the Windex mount. We’d taken some time to finish spec’ing a preventer system, so I went back to Grace to order more parts. In the late afternoon, we rode to the post office. I sold our “Exploding Kittens” game on e-bay and needed to ship it to its new owner in Montana We also went to the hardware store for fasteners and then stopped for groceries on the way home. Gary and Karen drove up to visit us, and even helped out by picking up Planet Express’ new whisker pole at Sailing Services and delivering it here. We would have otherwise needed to arrange for truck freight and a 5-day wait, or ask the owner to drive seven hours round-trip to Miami for it. Gary’s the rigger who gave Dobbs his start, and he and Karen ran Keys Rigging for a long time. It seemed fitting that Gary and Karen should arrive with a 12’ spar lashed to the roof of their Honda Fit. 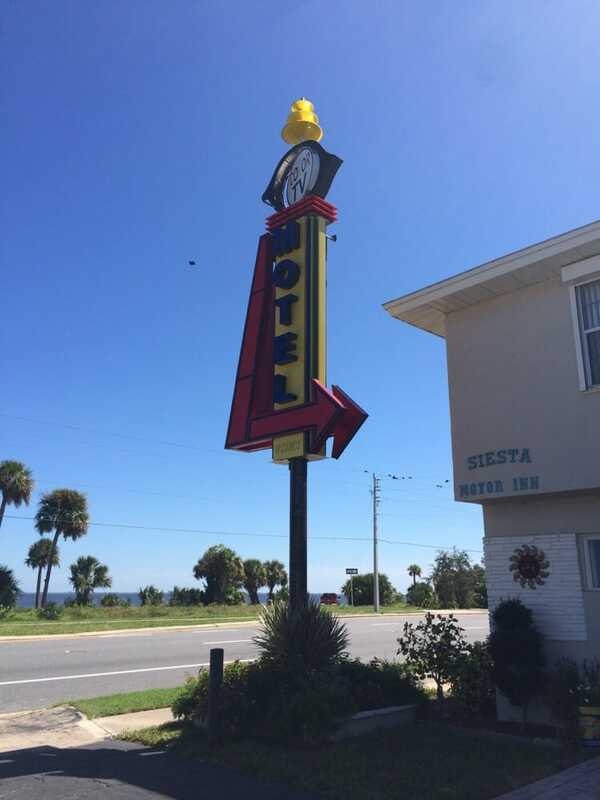 They’re staying at the Siesta Motor Inn on the south end of town. It’s a charming left-over from the 1960’s, complete with a fantastic “space age” sign advertising “Color TV”. I made dinner for us all here aboard Grace - chicken tomatillo stew over rice, and then passed a dessert tray of Tastycakes and treats from Trader Joe’s as we sat in the cockpit enjoying the cool night air.